BRUNSWICK - Linwood S. Billings, 78, died Saturday Feb. 9, 2019 at Mid Coast Hospital in Brunswick. He was born March 5, 1940, in Portland, the son of Freeman P. and Charlotte (Blodgett) Billings. Linwood lived in the Brunswick area for most of his life. He graduated from Brunswick High School with the class of 1958. 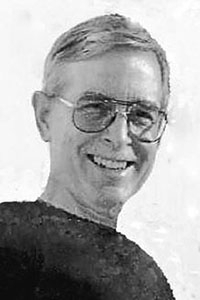 He continued his education graduating from the University of Maine with a bachelor's degree in 1962. He served with the United States Air Force from 1962 to 1967. Following his military service, he returned to the University of Maine and received a master's degree in psychology. He had worked for L.L. Bean, in Freeport, for five years and also as a realtor with Brunswick Realty Group, until retirement in 1997. Linwood was a member of the Downeasters Barber Shop Chorus of Portland. He was predeceased by a brother and is survived by his former wife, Susan (McNeary) Billings, of Brunswick; a son, Scott Billings, of New Gloucester, a daughter, Holly Billings, of Yarmouth; two grandchildren, Joseph and Elsa Billings; one great-granddaughter; several nieces, nephews and cousins. Visitation will be from 1 p.m. to 2 p.m., Sunday, February 24, at Brackett Funeral Home, 29 Federal St. in Brunswick. A memorial service will begin at 2 p.m.
(checks made payable to Horizons Activity Fund).